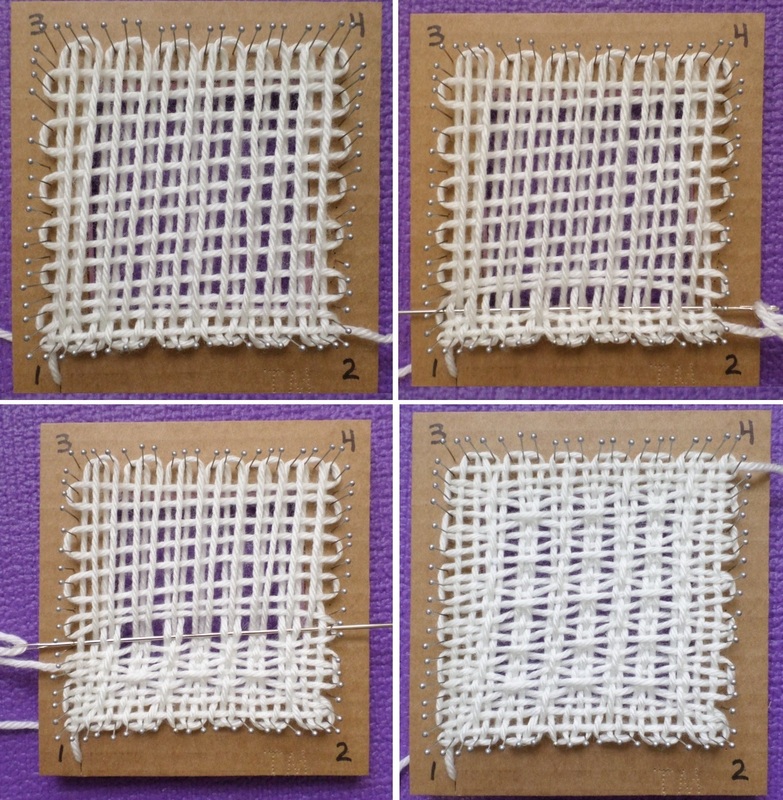 A member of the Facebook Pin Loom Weaving Support Group residing in the UK asked today about how to use a loom with equidistant pins (hereinafter referred to as “bias looms”). 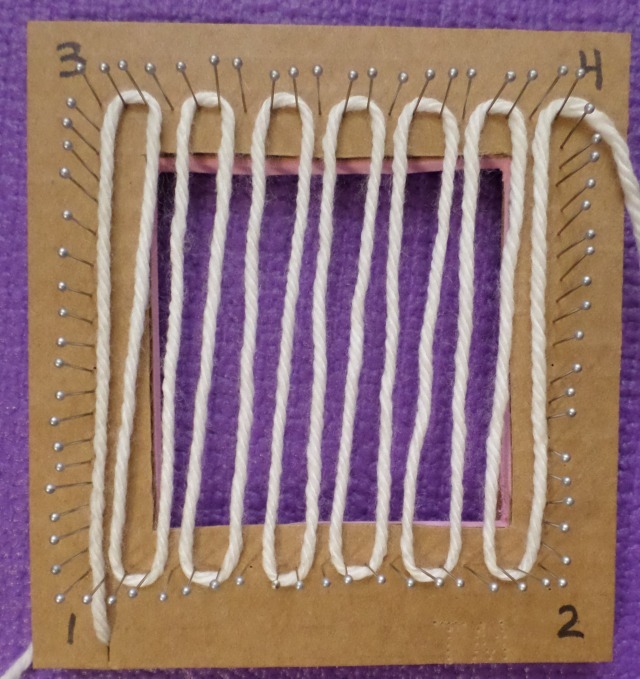 The only instructions she could find were for three-pin configured looms such as Weave-It and Zoom Loom. Someone asked her to post a photo of her loom—which was a wise thing to do. We all assumed she had a Loomette-type of loom (which I’ve written about before), but hers was different. The Loomette (which is not a bias loom) has 21 pins per side and no corner pins, for a total of 23 spaces. 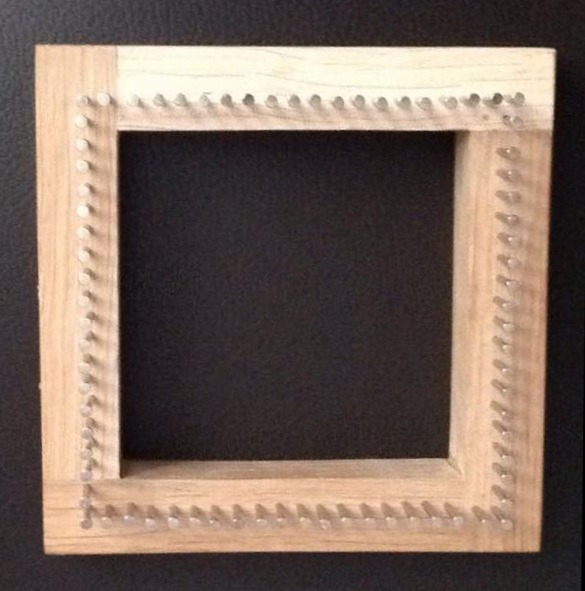 Our UK member’s loom has corner pins with 20 per side—for a total of 19 spaces. It seemed to some of us that this loom was designed for bias-style weaving and I didn’t think it would work in the three-layer warping (3LW) style. 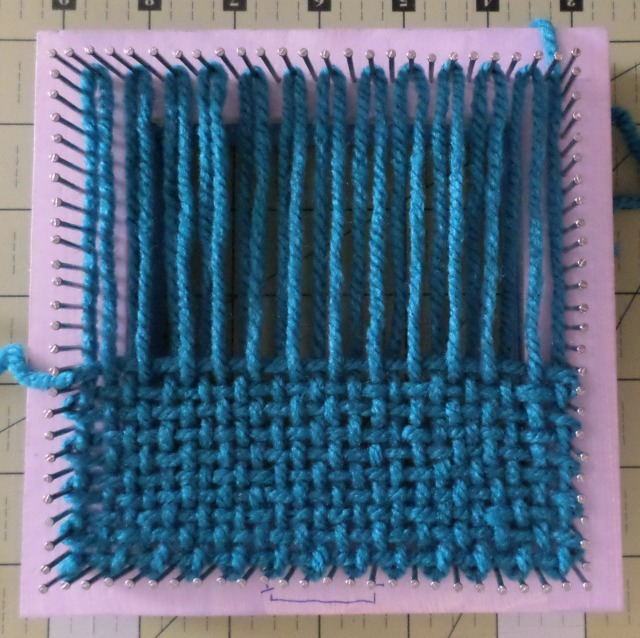 Personally, I think bias weaving is harder and less fun to do than three-layer weaving, so I thought I’d give this loom a try and see if it could handle the “funner” style. 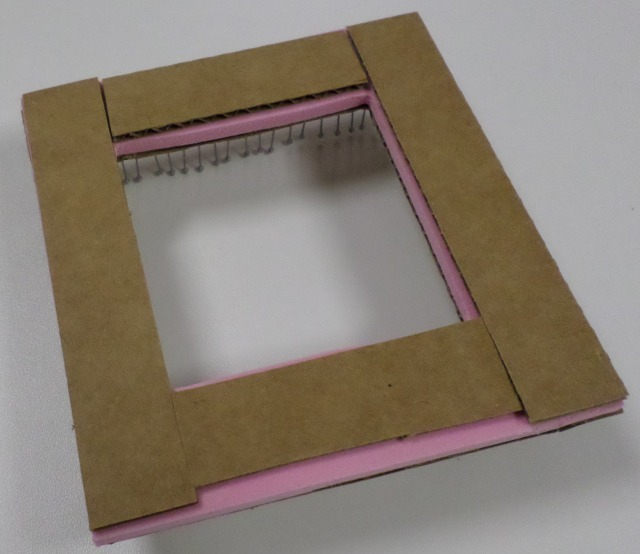 The cardboard pin loom is now sturdier with a layer of fun foam. It isn’t always necessary to add an extra layer of cardboard to the underside of a homemade loom. I added it because the pins poked through the thin layer of foam. Usually I use a garden kneeling mat for the foam layer, so no additional stuff is required underneath. Turns out the 19-space bias loom works with 3LW. It doesn’t have 31 x 31 strands though, so not all patterns weaves for the 4-inch Weave-It-style looms will work on this one. 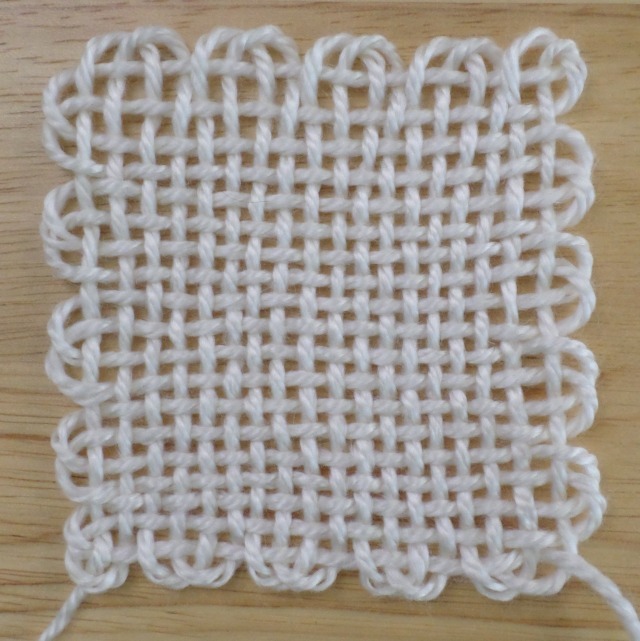 Also, the warping and weaving start and end at different corners. 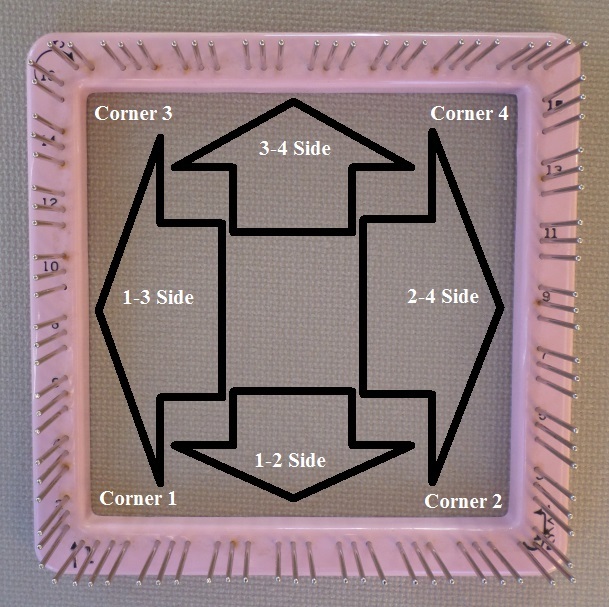 Since the bias loom doesn’t have numbered corners, you can choose any one and call it Corner 1 (Cr1) (see Glossary of Pin Loom Terms for explanation of abbreviations). You might want to write the corner numbers on your loom with a permanent marker. I will refer to the corners and sides of the loom in the terms pictured below. The basic instruction is: SKIP ONE, WRAP TWO, but this changes sometimes at the corners. Layer 2 (L2): At Cr4, wrap two pins (Cr4 pin and second pin at top of 2-4 side) and bring the yarn across to the 1-3 side. Here you will skip the Cr3 pin AND the second pin at the top of the 1-3 side. Wrap two pins, go across to 2-4 side, skip one, wrap two. Continue in this manner till you reach Cr2. (Please note: I tried not skipping two pins at Cr3 and the results were unsatisfactory.) When you get to Cr2, you’ll have to wrap three pins to begin L3. 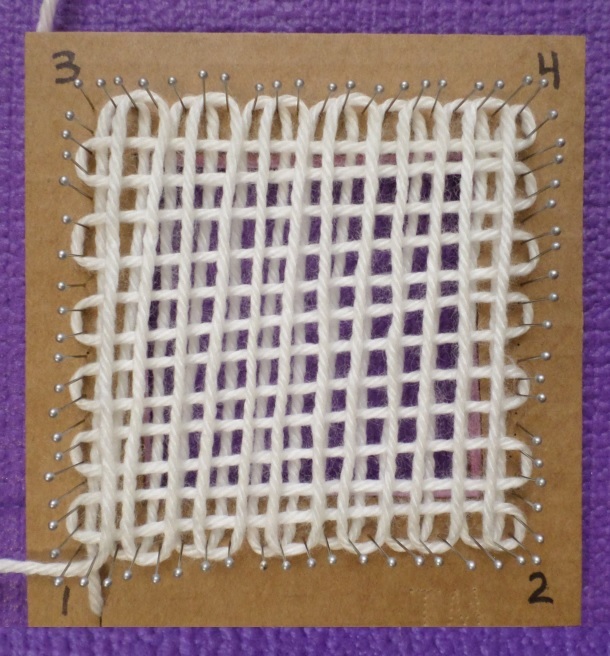 Layer 3 (L3): At Cr2, wrap the three pins that make up Cr2. Take the yarn up to the 3-4 side, skip the Cr4 pin and wrap the second and third pins next to it. Come down to 1-2 side; skip one, wrap two. On L3 you can see that these warps are located above and between the L1 warps. Continue wrapping two and skipping one. End L3 at Cr1 (with last two pins unwrapped). Layer 3. Notice that the Cr3 pin doesn’t get used. On the Weave-It or Zoom Loom, there is no pin at Cr3 (and the Cr4 pin never gets used in 3LW). 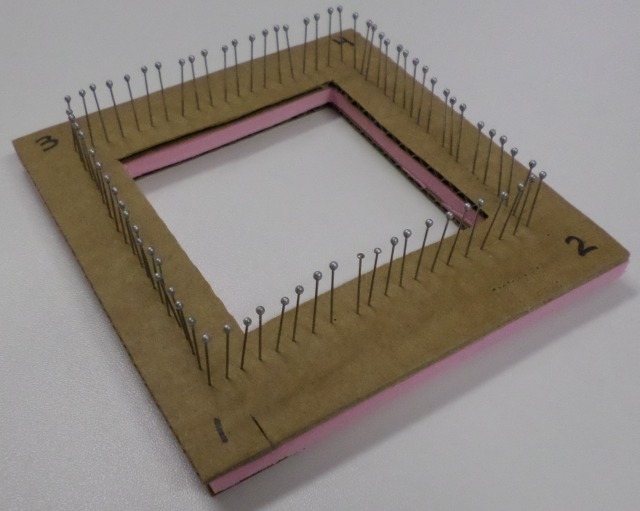 Wrap the pins 4.5 times to measure your weft. Cut yarn, thread needle. 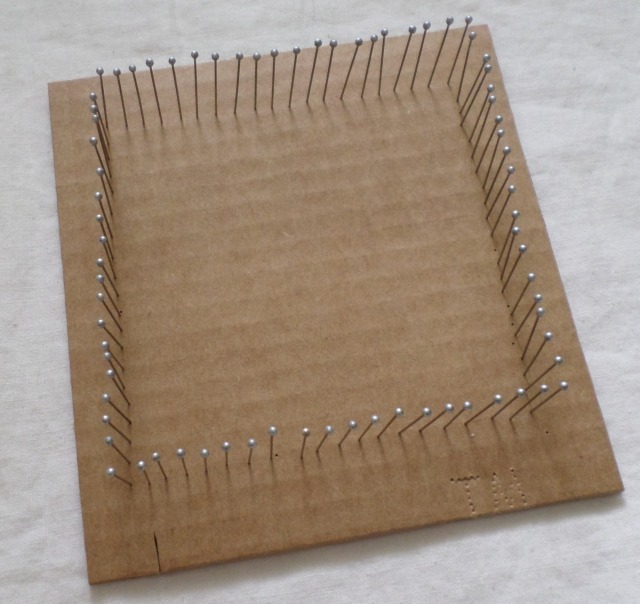 Use a fork to pack R1 against the pins, then pack the first L2 thread snugly against R1. The yarn will resist, so don’t worry too much. You’ll especially want to pack the early rows so you’ll have room to fit in the later rows. 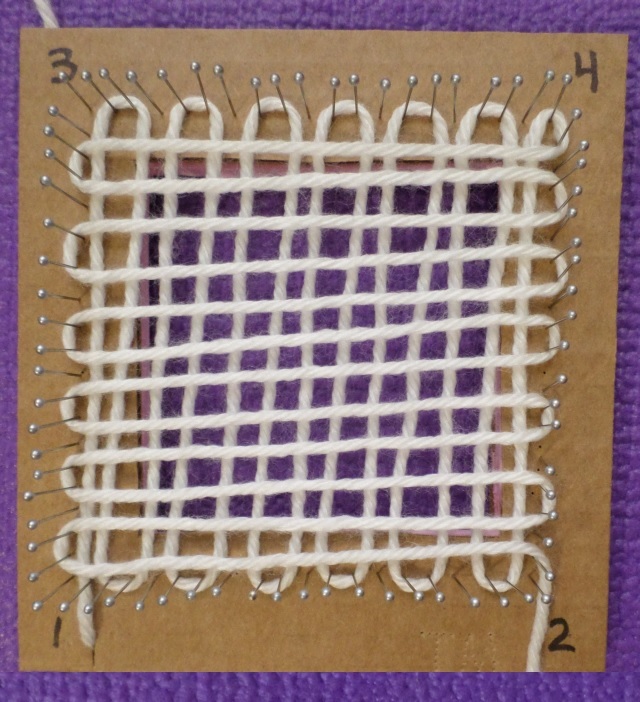 Each L4 row will be woven between the L2 threads. R2: Wrap ONE pin. (On all subsequent rows you’ll wrap two.) Take the needle U the first warp, O the second, and so on. You’ll start each row U the first warp. You’ll exit each row U the last warp and through the outer loop. R3: Wrap two pins at the beginning of the rest of the rows. Go U, then O across. Exit each row going through the outer loop. You’ll finish at Cr4 after weaving 13 rows. I got tired of weaving on the flimsy cardboard loom. The pins were starting to loosen. 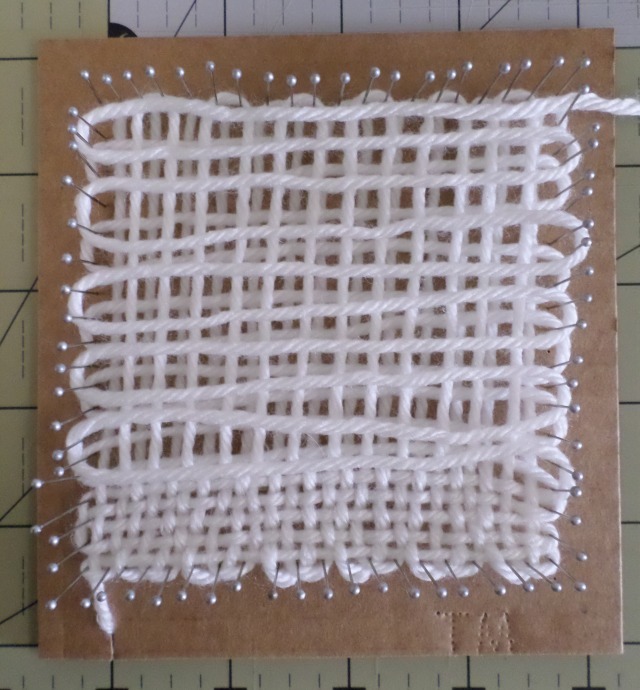 So, after R3, I laid the rest of the weft threads in place to show where the square would be finished at the end of weaving. Exit the square at Cr4 and remove it from the loom by pressing gently upward underneath the frame. 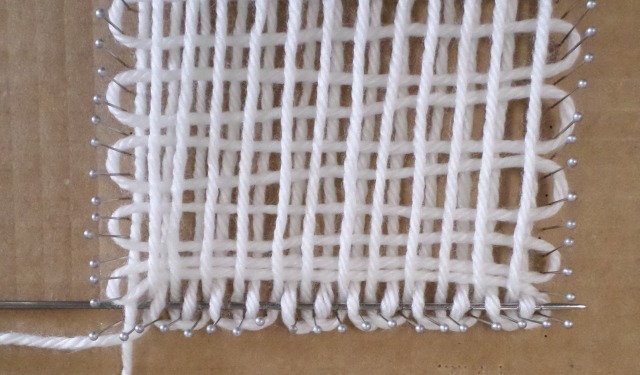 Plain weave, going under and over each warp, is the most basic form of 3LW weaving on a loom. 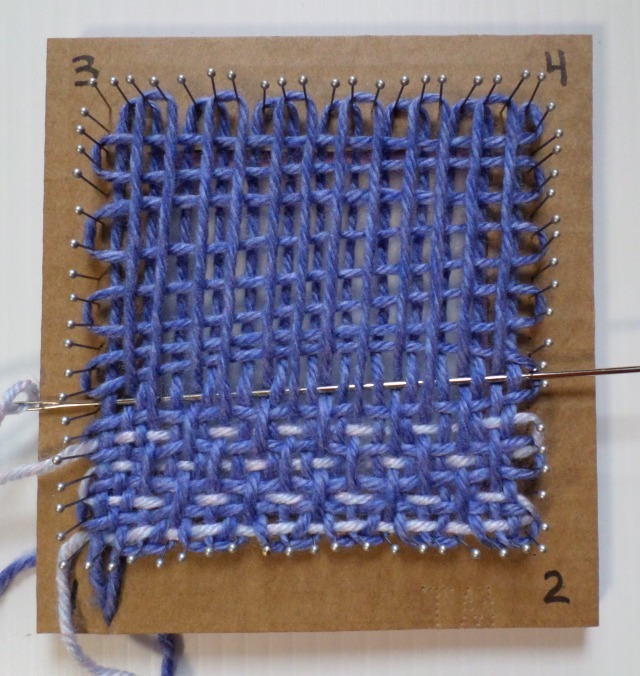 There are numerous ways to weave in ends as you go, use multiple colors, and do pattern weaving. All would work (sometimes with modifications) on this loom. Time for a pattern weave. I’m using my signature pattern. Repeat even and odd rows through R12. 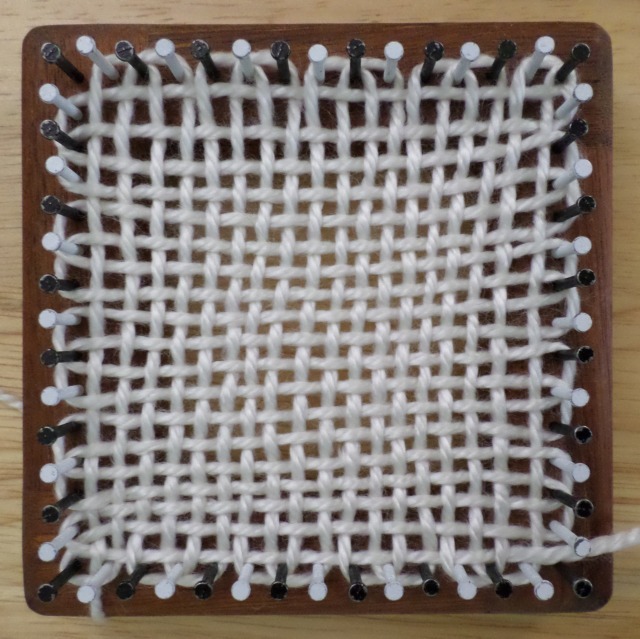 Don’t worry that the weaving is a bit slanted. In a piece this size they’ll straighten out once you take the square off the loom. While I’m in the neighborhood, I’d like to mention another pattern that also works on this loom. You can use the wrap two, skip one method on other bias looms. 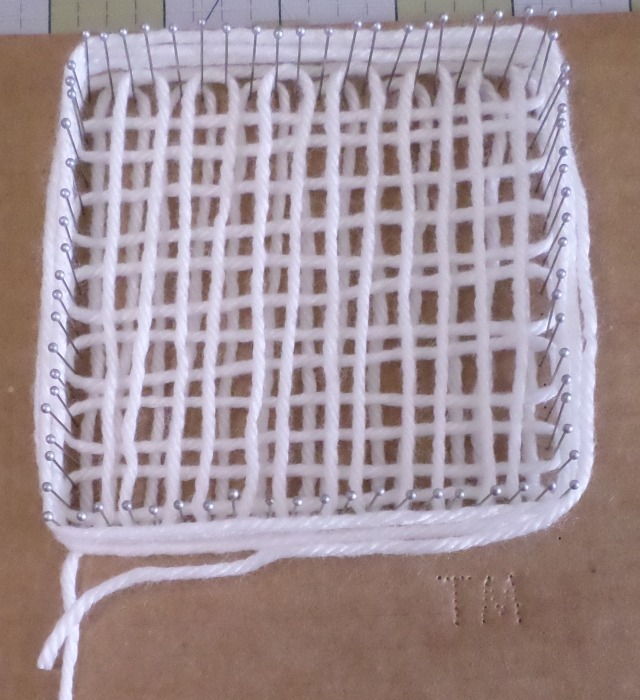 Below I’ve prepared a 5″ bias loom for two color weaving. All ready for weaving with a second color. 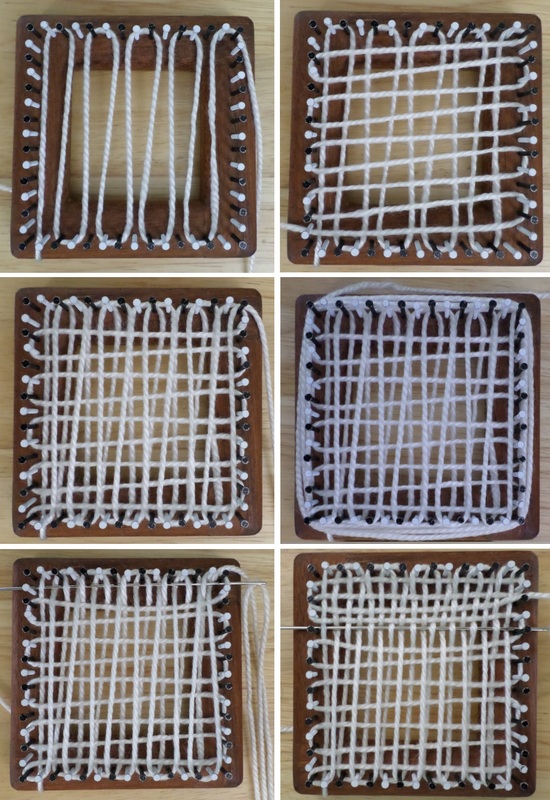 I had a friend over last week and she had several Hazel Room looms—the basic (bias) style, not the multi-weave type. 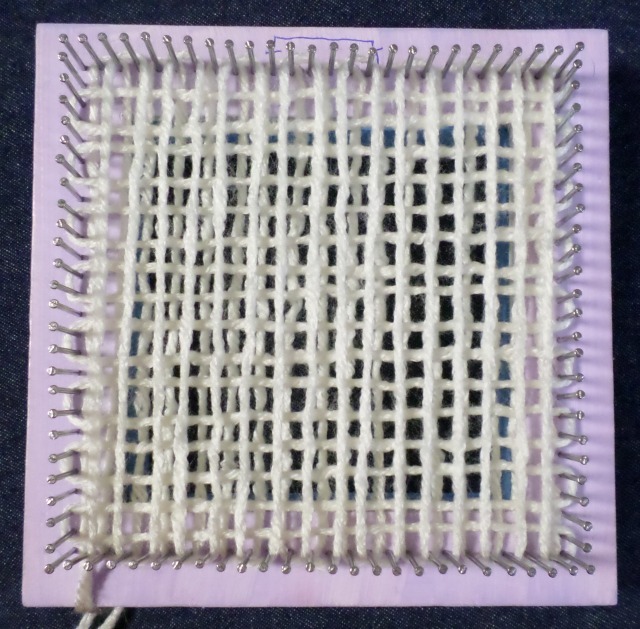 This loom had fewer than 20 pins. I should have used thicker yarn, but this was a quick experiment. Here’s how it turned out. Every time you’re on the 2-4 side of the loom you have to take the needle through the outer loop from beneath, then Over the first warp. Every time you’re on the 1-3 side of the loom you take the needle thorough the loop from above, then Under the first warp. 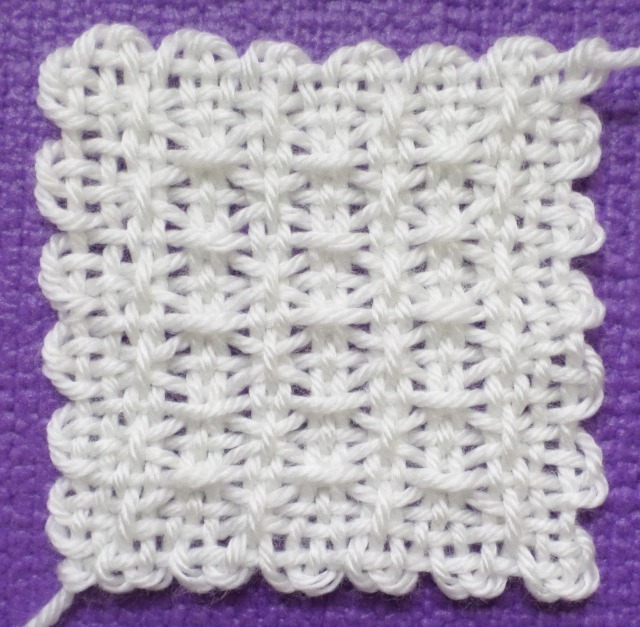 Begin weaving at Cr4. Come from beneath and go through the loop, Over the first warp. 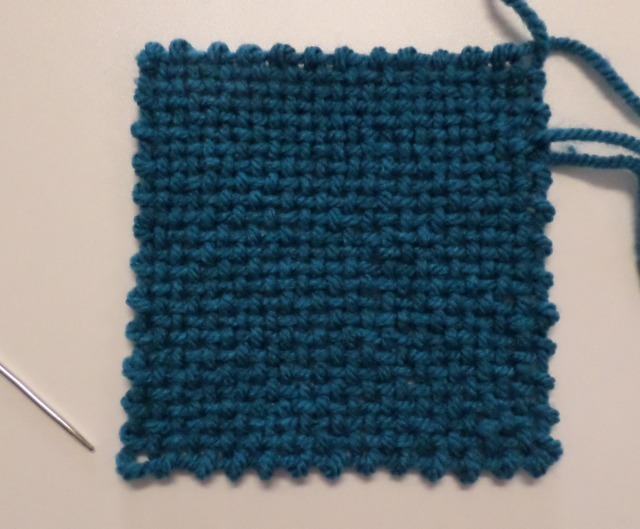 The finished square is a little airy, so I recommend a thicker yarn. It ended up not completely successful. In the lower left corner of both photos, you can see that I wrapped the pin and then immediately went Under it with my needle. This didn’t interlock the warp with anything else, so there’s an extra large loop there. Have to remember to watch for mistakes like that at the corners. Also note that I didn’t give myself enough weft. Not a problem, just add more. Needle is pointing to the mistake at the corner.